I’m probably not the best person to be writing about Daredevil’s long and complicated history with the Punisher. It’s not that I don’t find it interesting – and I’m actually very enthusiastic about seeing Jon Bernthal tackling the role in the upcoming season of Daredevil – it’s just that there are other fans out there who are more interested in it, and definitely more knowledgeable about Frank Castle as a character. 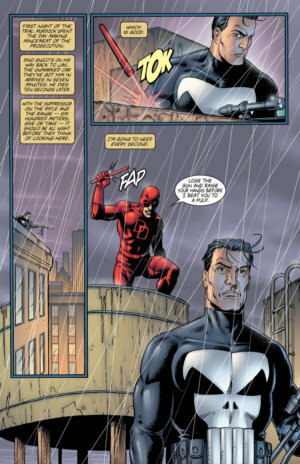 For a great list of some Daredevil/Punisher crossovers, look no further than this June 2015 IGN article on that very subject. 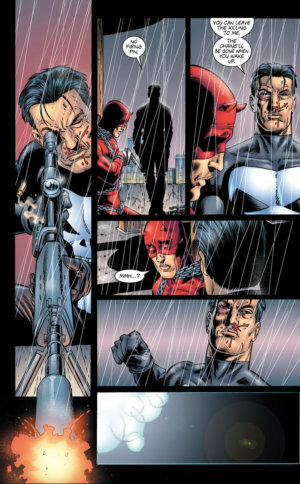 However, with the release of a certain official photo of Matt and Frank on a rooftop, everyone who is even vaguely familiar with a certain story from Punisher #3, vol 4 (2000-2001), by Garth Ennis and Steve Dillon, have been pointing out the obvious similarities. When this scene was mentioned in the comments of my last post, I decided to pay it a little visit for myself. 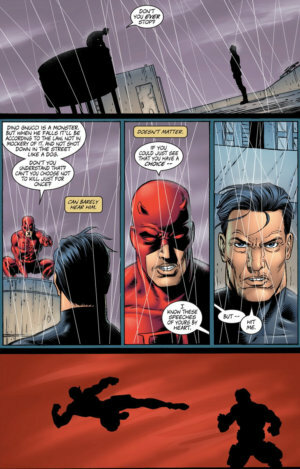 Daredevil: You have to be out of your mind! I’m not going to kill you! Punisher: Then Dino Gnucci’s a dead man. Daredevil: No! Nobody has to die! You don’t have to do this! Dino Gnucci deserves to be taken off the streets, but legitimately! For something he’s actually done! And it has to be that way or else everything, these laws we have, the society we’ve built is all completely worthless! For crying out loud, man, don’t you see that? Don’t you see? Punisher: The thought of Dino Gnucci living one more minute is enough to drive me insane. Don’t you see? So, how does it all end? 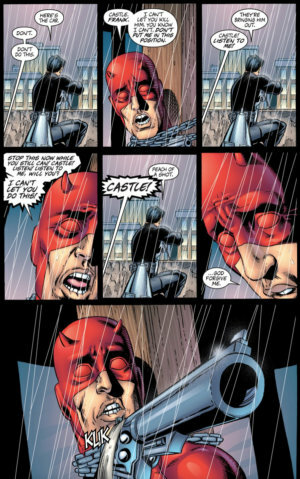 Well, Daredevil actually pulls the trigger. Of course, even that part of this elaborate set-up is a trap. Frank gets to go on “punishing” with his head intact, probably satisfied in the knowledge that Matt will be tormenting himself for weeks. Since this story takes place in a Punisher book, we never actually find out how Matt deals with the aftermath. So, how much of this can we expect to see in season two of Daredevil? I personally think that the similarities will be superficial. Frank may very well have Matt witness him commit a crime, but there might not be a choice to be made, as Matt’s options appear even more limited than in the comic. More importantly, the scene from the comic builds on the fact that Matt and Frank are well-acquainted with each other in every way. In fact, Frank’s annoyance with Matt stems mostly from the fact that he’s so very predictable in these matters. Likewise, Matt’s choice is informed by his knowing exactly what kind of man Frank is. In the Netflix show, Frank will be the newcomer. He may know a thing or two about Daredevil, who has obviously been patrolling the streets for some time, but considering Matt’s relative lack of restraint in season one, it seems unlikely that he’s built a reputation of moral superiority. Then again, this scene may actually be set fairly late in the season where the two have had some time to cultivate their mutual animosity. 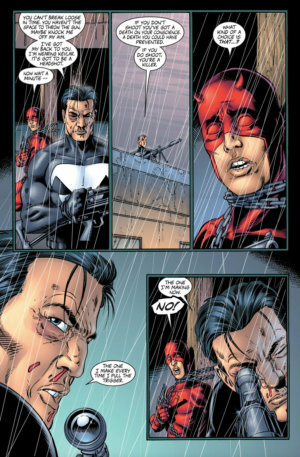 And maybe that’s the amount of time Matt will need to realize, definitively, that he is not the Punisher. What do you guys think? 59 days, 5 hours, 16 minutes… this is torture. I can’t wait for this! Welcome to the party Frank. Glad you’re here. Gonna be a hell of a season. Punisher, Elektra, and the return of Stick. This was Ennis’ first crack at the Punisher. He would go on to write another 100 issues or so through various volumes of the character. Just this week I started working my way through the trades of his Punisher Max series. Really good stuff. This was a really powerful issue that showed off the differences between Matt and Frank. Its to bad we didn’t get to see the ramifications of these events on Matt. Matt tends to beat himself up over situations like this, and his decision to pull the trigger was sure to have really sent him for a loop. I am looking forward to seeing the dynamics between the two men in the coming season. If done right, this could really cement Matt’s ideals and morals as a hero and complete the story arc that he started by not killing Fisk and rising above his anger. I do think Frank will serve as a middle ground between Matt and Fisk. A middle ground that will push Matt closer to the side of the Angels. That being said I really hope that here is some screen time between Frank and Stick! I think the two of them will be on similar tracks of thinking. Plus, Punisher and Stick has got to be a winning combination! I am surprised that they are making Frank the main antagonist this season. Im still assuming that they will throw in somebody worse then Frank to counter point his views and make him a little more sympathetic. Maybe by bring back Fisk or the Owl. But still, the interplay between the two is going to be great! I am looking forward to it even more then I am Batman and Superman. But Frank has to wear the white skull! The DD symbol might be to much, but please give us the White skull! Also we cant forget Elektra. She might lay in-between Matt and Frank ideologically. Much of the season might be the two men trying to win Elektra over to their point of view. Matt trying to redeem her soul, and Frank trying to convince her that her assassin ways are the correct way of doing things. And again that puts Stick in an interesting place on which side he falls on. Lots of questions, cant wait to find out the answers. If season two is even close to as good as season one we are in for an awesome treat! Just curious Christine, but what are your feelings of Matt actually pulling the trigger in this issue? We have to take into consideration that this was in a Punisher comic, so Frank is going to get the upper hand and get to make the point, but it was still a pretty extreme move. Im a little iffy on it, but I guess Matt really didn’t have much of a choice. Btw a fun post might be to look at the times Matt has almost lost his temper and went over the edge. Matt has anger and impulse control issues that he is constantly fighting to keep in check. These issues usually go hand in hand with his depression and self destructive tendencies. These parts of Matt’s personality were heavily featured in the first season of the show, especially with Matt wrestling with his want to kill Kingpin. But Father Lantom steered Matt from this path and taught him that his anger, his Devil as it were, could be used for good. I think this character arc will continue to be important in the second season as Matt sees what he would have become if he had given in to his impulses and killed Kingpin. He would have become the Punisher. So it might be fun to look at the different times in the comics that Matt struggles with the same moral dilemma of giving in to his rage. Just a thought.